Sambar is a lentil stew popular in the cooking of south India. 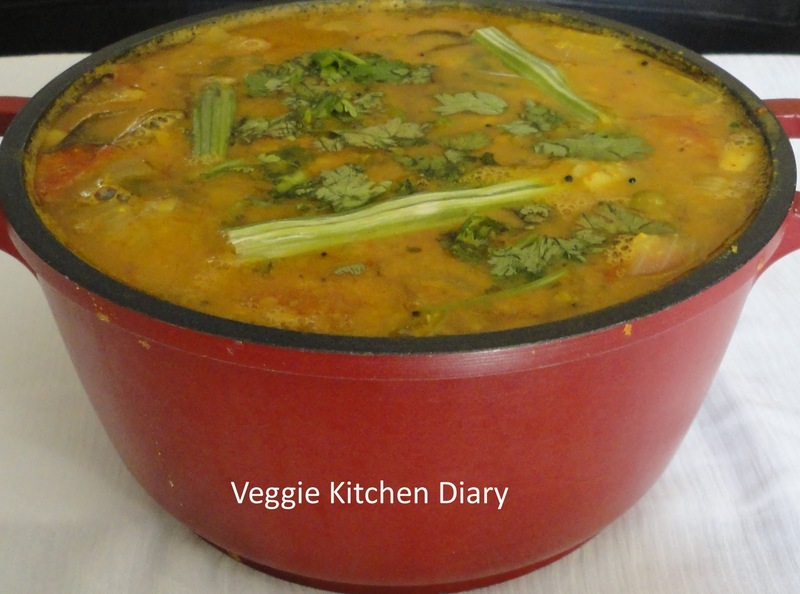 It is generally composed of yellow lentils (toor dal) simmered with tamarind-flavored water and a special blend of spices called sambar powder. 1.Pressure cook the toor dal in 3 cups of water with turmeric powderand fenugreek seeds to a soft consistency (approxmately for 3whistles). 2.In a thick bottomed vessel , heat the oil add mustard seeds,fenugreek seeds.Lower the flame add red chillies ,curry leaves and hing. 3.Add the onions,tomatoes,bottlegourd ,and drumsticks.Sprinke water and cover and simmer till done. 5.Add coriander leaves and switch fo the flame. 6.Serve hot with Rice accompanied bya roasted papad.